Pre-terminated loose tube cable assemblies. A new product from AFC Group. Home > Pre-terminated loose tube cable assemblies. A new product from AFC Group. Introducing an expansive range of superior pre-terminated loose tube cable assemblies from AFC Group . The cable assemblies which now come in 48 fibres are manufactured in-house and can be combined with any cable lengths and connectors. With a maximum hauling tension of up to 50kg, the optional hauling mechanism provides extra protection during installation. 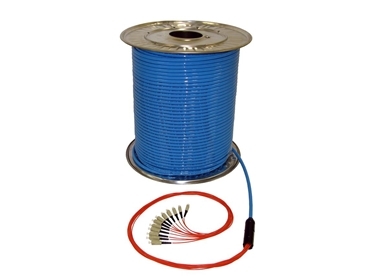 Offering first-class protection during hauling and installation, the cable is terminated at both ends with a strong loose tube fanout kit which come in 2 styles. Both fanout styles – rugged and mini, have colour coded fanout tails and available for both single mode and multimode. The mini fanout kit is perfect for any enclosure with 20mm holes with its small overall diameter. The pre-terminated loose tube cable assemblies can be directly plugged into your equipment without any need to splice and the need of cassettes and pigtails. The tube cable assemblies are a proven product proving reduction in installation times and terminations and testing costs.